There are so many killer deals out there for Cyber Week covering popular headphones. Bose’s first and only true wireless earbuds are down to their lowest price, for example, and the insanely popular Bose QuietComfort 35s are still $50 off as well. Even on sale though, Bose headphones are still quite pricey. 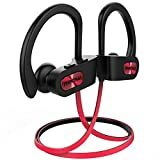 If you’re looking for something that sounds great, offers solid battery life, and features water-resistance for even the most intense workouts, the Mpow Flame Bluetooth Headphones just dropped to a new all-time low of $15.89 for Cyber Week. They’re Amazon best-sellers, and they’re easily worth several times what you’ll pay for them if you snag a pair today.